Ninja Intelli-Sense Kitchen System features one smart base that transforms into three high-performance appliances while 12 chef-designed Smart Programs effortlessly create an endless array of delicious recipes. With Ninjas Smart Vessel Recognition, program selection is easier than ever, so any time spent in the kitchen is as easy as Snap. Touch. Go. 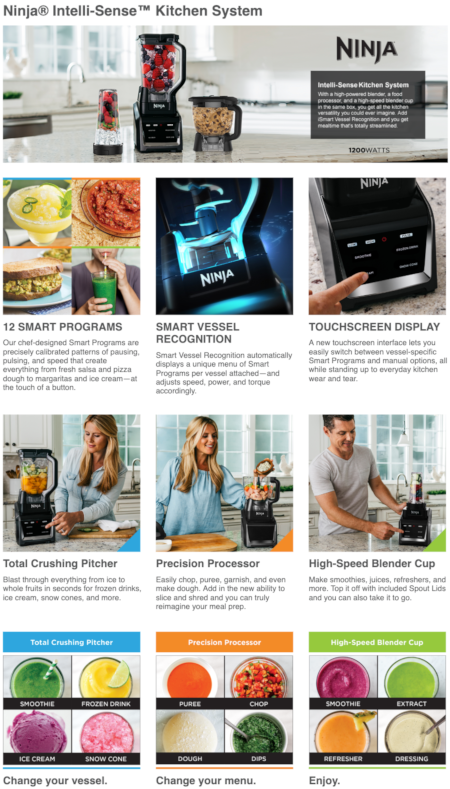 12 SMART PROGRAMS: Our chef-designed Smart Programs are precisely calibrated patterns of pausing, pulsing, and speed that create everything from fresh salsa and pizza dough to margaritas and ice cream—at the touch of a button. SMART VESSEL RECOGNITION: Smart Vessel Recognition automatically displays a unique menu of Smart Programs per vessel attached—and adjusts speed, power, and torque accordingly. TOUCHSCREEN DISPLAY: A new touchscreen interface lets you easily switch between vessel-specific Smart Programs and manual options, all while standing up to everyday kitchen wear and tear. 72 oz. Total Crushing Pitcher: Blast through everything from ice to whole fruits in seconds for frozen drinks, ice cream, snow cones, and more. 8-cup Precision Processor: Easily chop, puree, garnish, and even make dough. Add in the new ability to slice and shred and you can truly reimagine your meal prep. 24 oz. High-Speed Blender Cup: Make smoothies, juices, refreshers, and more. Top it off with included Spout Lids and you can also take it to go.